The High Peak Artists' & Craft Workers Association was founded 13 years ago. Its members are drawn from around the High Peak area of Derbyshire and consist of both professional & amateur artists. 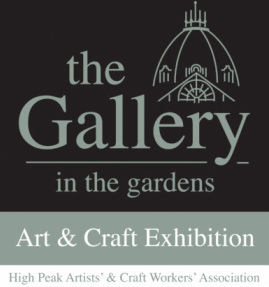 The co-operative operates a gallery within the Pavilion Gardens, Buxton - 'Gallery in the Gardens'. 39 members exhibit their work all the year round in this purpose built space. Members' work includes paintings in watercolour, oil, pastel & mixed media; studio pottery & domestic ceramics; contemporary jewellery; photography; calligraphy; traditional embroidery & embroidered batik; etchings & linocuts; silk paintings; fused glass; turned wood; designer knitwear & felted items; hand made bags & textile accessories plus a large selection of limited edition prints. Members periodically run workshops for the general public, these include watercolour & oil painting, pastels, jewellery making, silk painting, calligraphy & ceramics. The group also runs a painting competition for children in association with Vision Buxton.